One night only! 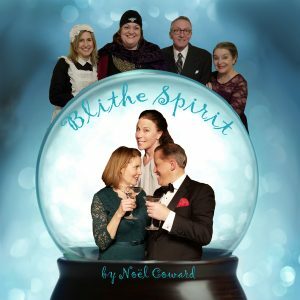 On May 18 a ghostly comedy, Blithe Spirit is paired with gourmet dining at Crabtree’s Kittle House. Crabtree’s Kittle House, a farm-to-table restaurant with award-winning wine cellar and a history that spans more than 200 years, is partnering with M&M Performing Arts for a very special one night superlative dinner-theater experience on Saturday, May 18 at 7:00 pm. Tickets include show, dinner and wine/beer at $114 – Hors d’oeuvre reception, 3-course dinner, and lots of fun! Tickets are available at mmpaci.com or KittleHouse.com or directly at brownpapertickets.com/event/4218688 or via phone at 800-838-3006. Blithe Spirit is a high-spirited comedy with a surprising supernatural turn. This much-loved classic centers on an invitation to an eccentric medium to conduct a spooky séance but the evening takes an unexpectedly ghostly turn in this lighted-hearted, endearing Broadway smash hit by Noël Coward. Directed by Michael Muldoon, the cast is comprised of: Kathy Files DiBiasi, Kate Gleeson, Kelly Kirby, Kurt Lauer, Elizabeth Mialaret, Melinda O’Brien and Larry Reina with stage management by Emmy Schwartz and Nan Weiss. The Performance is in the Atrium Carriage Room at Kittle House, which is located at Eleven Kittle Road, Chappaqua New York 10514. Please note: dining tables are communal, and arranged at Kittle House’s discretion. We welcome any seating requests, and will do our very best to honor them. Price includes wait staff gratuity. An alcohol-free dinner is available. For more information please call Kittle House at 914-666-8044. About M&M Performing Arts Company, Inc.
Resident Theatre company of Lyndhurst Mansion in Tarrytown, and traveling performances in libraries, community centers bringing quality live theater to intimate spaces. This entry was posted in Press Releases and tagged Comedy, dinner theater, theater. Bookmark the permalink.